The National Institutes of Health (NIH) describes dyslexia as a brain-based learning disability that specifically impairs a person's ability to read. Dyslexia affects about one in every five individuals, making it the most commonly diagnosed learning disability. These reading impairments are also unexpected in that individuals with dyslexia demonstrate otherwise typical intellectual functioning and developmental growth. To further understand what dyslexia is – and what it is not – it may be helpful to examine the major elements of the definition. For individuals with dyslexia, specific portions of the brain typically associated with important reading processes may not function in the same ways that they do in individuals without dyslexia. Dyslexia affects the brain areas associated with detection and processing of sounds and their corresponding letters. These letter-sound linkages are fundamental to reading. When these brain regions do not function efficiently to make connections, reading development is affected. Dyslexia can be inherited. Children born with the neurological impairments associated with dyslexia are more likely than other children to have family members with the impairment. Many, but not all, of these children will eventually experience reading difficulties. Dyslexia can have a late onset. This typically occurs because of brain injury or in the context of dementia, and negatively impacts the same brain areas. Individuals with dyslexia often have difficulty with phonological processing, spelling, or rapid visual-verbal responding. Difficulty with phonological processing is the inability to effectively decode letters into blended sounds to form words. A fundamental phonological processing problem may “block” access to other more advanced aspects of reading, such as word identification and comprehension. Difficulty with spelling may be recognized in an inability to efficiently write the letters comprising words from memory. Increased time needed to spell words and spelling errors may be apparent. Difficulty with rapid visual-verbal responding may be evident when it is increasingly difficult to quickly verbalize the letters and words appearing in print when prompted to do so. Dyslexia is related to reading difficulties, not difficulties that arise from intellectual functioning. Dyslexia does not imply the individual cannot read. Rather, it suggests reading may require significantly more effort for someone with dyslexia. Dyslexia does not change the intellectual, imaginative, or emotional functioning of the individual, and it does not affect the brain’s structure. In non-reading areas, abilities of those with dyslexia mirror those without dyslexia. Individuals with dyslexia do not necessarily see and write letters or words backwards. Dyslexia is associated with brain-based phonological impairments, not visual problems. Dyslexia is a brain-based learning disability that specifically impairs a person’s ability to read. For individuals with dyslexia, specific portions of the brain typically associated with important reading processes may not function in the same ways that they do in individuals without dyslexia. Individuals with dyslexia often have difficulty with phonological processing, spelling, or rapid visual-verbal responding. Importantly, dyslexia is related to reading difficulties, not difficulties that arise from intellectual functioning. 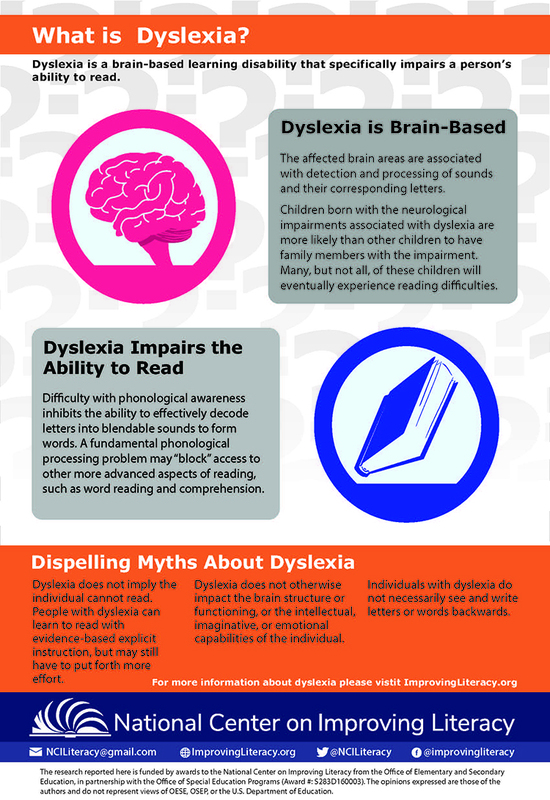 This fact sheet discusses the signs, symptoms, and supports for dyslexia. Read a letter from OSEP describing the implications of federal law on disabilities for state policy and practice, especially concerning the identification and treatment of dyslexia.